Third among the patriots who risked everything to apprise Churchill of Britain’s weakness was RAF Wing Commander Torr Anderson (played by David Quilter), director of the Air Force Training School, who pours out his worries to Churchill’s secretary Violet Pearman (Sherrie Hewson) and joins the statesman’s inner circle. You must excuse the painting session in the drawing room—at Chartwell, Churchill’s indoor painting was always done in his studio. Then, in a private tête-à-tête which symbolizes much of their relationship, Baldwin secures Churchill’s agreement to second Chamberlain as his successor. This enrages Brendan Bracken (Tim Piggot-Smith), but is quite in character. Churchill felt obliged to honor his obligation as Senior Privy Counselor, and his friendship with his old chief, despite their political disagreements—very typical of him. So Baldwin goes and Chamberlain takes over, and Churchill is not asked to join the government. Robert Hardy shows us his frustration, torn between making Britain’s weakness public for enemies to see, or to muffle his protests in the hope that Chamberlain will realize the mounting peril. He is rudely brought back to earth when Anderson tells him that the RAF is welcoming a visitor, the German Air Minister Erhard Milch, who has been rebuilding the Luftwaffe. Ironically, the RAF is scratching for enough planes to impress Milch, even though some of them can’t even fly. Ah, to be in the Reich now that spring is here! In another expression of fellowship, Hermann Goering has invited Lord Halifax, then Minister of War, on a hunting holiday, although more correctly the British should have sent Foreign Minister Eden. This scene symbolizes Eden’s growing dissatisfaction with appeasement, which leads to his resignation in February 1938. 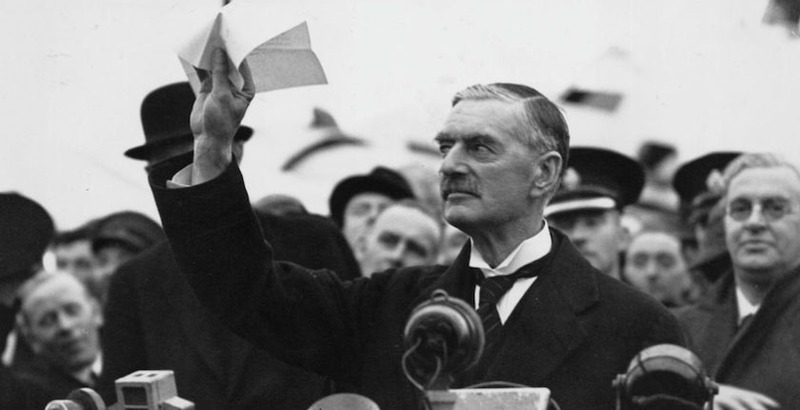 Featured Image: Prime Minister Neville Chamberlain during his now-infamous “peace in our time” address, delivered following the Munich conference of 1938.